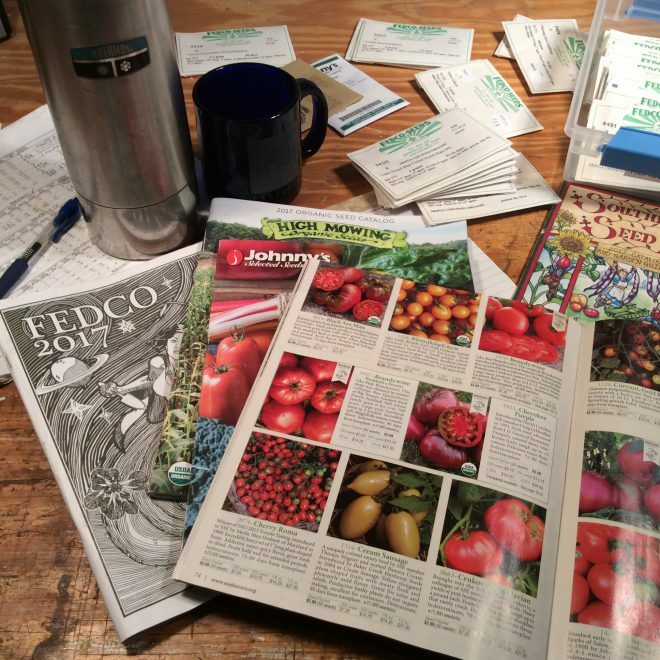 January on the farm is all about planning: What new thing will I try? Who will I hire onto the crew? Where did those tax records go? When will I fire up the greenhouse heater? Why, again, am I doing all this? (Sometimes, even, how in the world did I get myself into all this?) And each season’s plan begins with my drafting three connected documents: the seed order, the budget, and the seeding schedule. I usually complete the seed order first, which, frankly, is backwards. I should really draft the budget first so I know how much there is to spend on seeds, followed by the seeding schedule, so that I know exactly which and how many seeds to order. But I like to have my seed order placed by mid-January. If I wait much longer, the greater the chance I’ll encounter back-ordered and sold-out varieties. So to make sure I get what I want, when I want it, I do a couple of quick, back-of-the-envelope estimates, and go from there. I can always place a supplemental seed order if I find later I’m a little short. Once the seed order is completed, I turn my attention to the budget. To be honest, this is one of the more stressful chores of the season. Like a lot of businesses, farming’s margins are razor thin, and even a slight miscalculation can make the difference between ending the season in the black or the red. So I work hard to make the budget as accurate as I can, even overestimating costs a little so that there’s a little give in the numbers, just in case. But each year making the budget does get a little easier. As we build up our infrastructure, there are fewer critical big-ticket items to pay for, and as our membership grows, there’s more income to help pay for everything. Finally, I draft the farm’s seeding schedule, which is the most exciting of the three to prepare. This big spreadsheet is the roadmap for the farm’s season, telling me how much of what vegetable to start, when to start it, what size pot to plant it in, when to transplant it into the field, and at what spacing. By November, it’s stained with coffee, smattered with mud, crinkled, creased, and covered in hastily scrawled notes — a historical artifact, of sorts, embodying the course of the season, and something I refer back to as my primary guide when the process starts all over again the next year. And with each passing day in January, the farm stirs more and more from it’s hibernation, like some great animal eager for spring. To tell the truth, I’m eager for it, too.